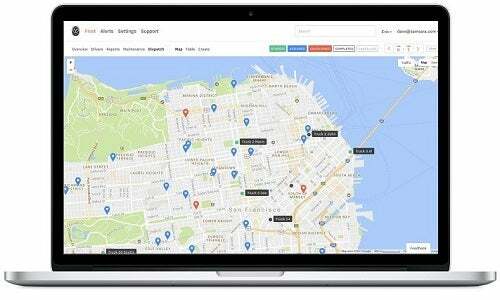 Routing & Dispatch: Samsara lets fleet managers communicate with their vehicles in real time, through a messaging app. They can confirm they’ve reached a destination and dispatch them on the next task, reroute vehicles or guide lost drivers step-by-step over the phone. Managers can then compile the data into reports that cover each vehicle’s total stops, missed stops, and early/late stops, giving each vehicle an at-a-glance performance score. A route analytics section on the fleet manager dashboard will also display the contrast between the route managers planned for, and the route that drivers ended up taking in reality. Managers can use the information to adjust future routes to account for the times and routes that their drivers need. Samsara’s online FAQ page can further help fleet managers understand how to optimize routes through their FMS dashboard. Time on site: This feature presents fleet managers with a heat map of the areas at which drivers spend the most time overall. Managers can easily tell which locations their business serves most often, and how much time drivers take to arrive at their destinations as well as how long they spend at each one. Mobile options: The Samsara FMS dashboard is designed for desktop use but all dashboard features can be accessed on mobile devices. The mobile interface does have a more limited functionality however. ELD Compliance: The Samsara Driver App allows drivers to view the regulation-compliant data of their hours of service that has been recorded by devices with access to their vehicle engines. The drivers won’t need any special hardware to view the reports, just an Android or iOS tablet or phone. 2018 is the first full year that U.S. commercial motor vehicles are required to use an electronic logging device to track their hours of service. Since drivers will have Samsara’s automatically compiled report in front of them, they’ll be able to avoid the recent ELD regulatory fines when pulled over for a roadside inspection. Hardware: The Samara fleet management system includes plug-and-play hardware devices that must be installed in each vehicle by operators, though the process is a simple one. These devices come with a one-year warranty.